The ideal vision is that people in the world will be able to live together and share a common bond of peace and prosperity. How can that be accomplished? The answer may be easier that you think! That event proved to be a defining moment in Carolyn’s life and provided her with the following inspiration: “No matter how humans plan and work for the future, we are not in ultimate control. God is. He can choose to make our plans happen or thwart them. He can choose to protect our nation or lift his hand of protection from us.” That moment inspired the the writing of the book, A Promise to America: God’s Guarantee. The book focuses on how terrorism and world events threaten America as never before and how Christians in America cannot be lured into modern complacency but need to practice Godly obedience in order to preserve America’s future. “It is a responsibility beginning with God’s people and radiating to every citizen,” claims Carolyn. Weaving heart-warming stories with hard-hitting facts, Carolyn Corbin tackles such paradoxical contemporary issues as cultural relativism in a nuclear, biological, and chemical weapons world, conflicting religious ideologies, possible messages in the 9/11 terrorist attacks, prayer, forgiveness, sin, humility, relationships, and America’s social and spiritual dilemmas. Carolyn then justifies why she embraces the idea that America’s best days are ahead. Known for her high degree of accuracy in her 25-year career as a socioeconomic futurist, Carolyn Corbin provides practical steps for actualizing Godly faith based on a fresh contemporary approach to 2 Chronicles 7:14. This book is Biblically sound, motivating, and actionable. When you have finished, you will feel stimulated to DO something. A Promise to America: God’s Guarantee should be the handbook for every Christian who wants to make a significant difference in America’s future. 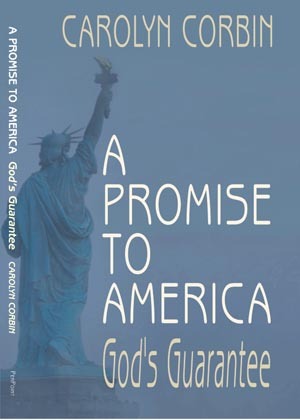 For information on scheduling Carolyn Corbin for a speech or seminar on A Promise to America: God's Guarantee, or to order copies of the book and/or the free leader's guide, contact the Center for the 21st Century.